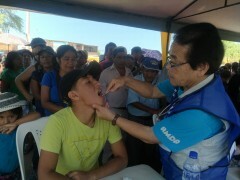 On April 10th local time, AMDA jointly provided medical service to the affected people with SES (Socios En Salud) under a tent in a park in Piura Region. Three doctors of the joint team saw 95 patients in the morning. Major symptoms seen among patients were muscle ache, joint pain, and headache. From now on, mosquito-borne infections such as Zika fever and Dengue fever need to be monitored not to become epidemic. Ministry of Health in Peru has been distributing leaflets and putting posters to prevent those diseases by warning people not to leave puddles or trash on the street, calling on local residents to be careful of mosquito bites. At night on the same day, AMDA doctor and coordinator flew back to Lima from Piura. On the next day, they, along with staff from AMDA Peru, reported to Ambassador Kabutan of Japan Embassy in Peru about AMDA’s relief activities in the past weeks. Ambassador Kabutan stated, "Japanese government has provided relief goods but not people. We feel grateful that you came all the way to help Peruvian people from Japan." As of now, AMDA doctor and coordinator are on their way back to Japan. AMDA Peru and AMDA Japan will continue to monitor the signs of the outbreak of infectious diseases.